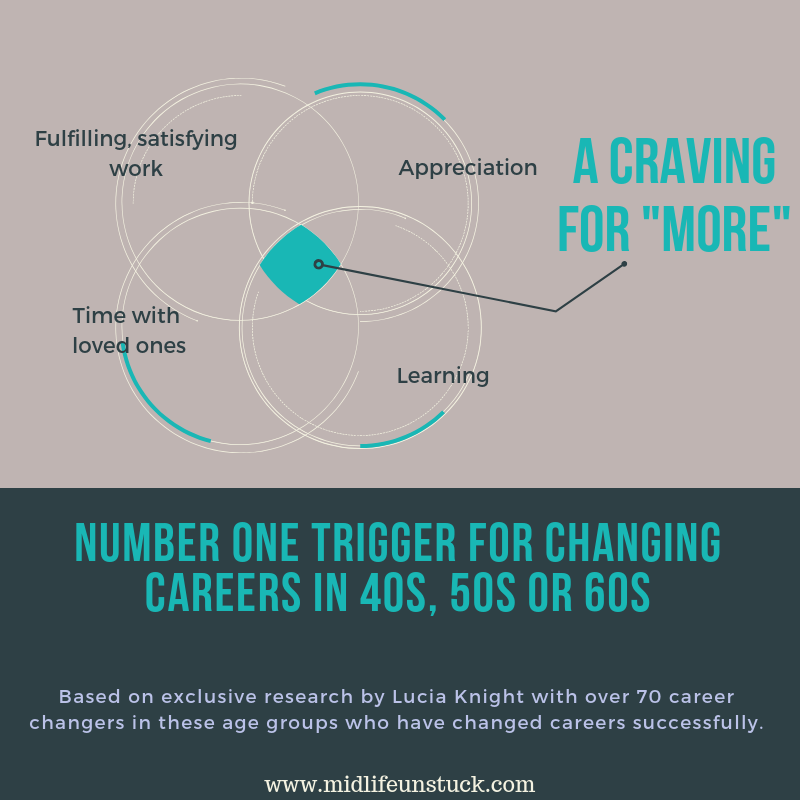 In a recent article, you saw the second most popular trigger for successful career change at our age. Now, let’s explore the most popular trigger for career change. But before we do, did you do the task at the end of the last article? I suggested you write down the 3 things that you want less of in your future work. I would be surprised if you found the exercise difficult. Figuring out what the problems are takes no time. If you are reading this, you may have been thinking about what you don’t want in your work for some time? But somehow, very little has changed? One major cause for that is that by continuing to focus on “the problem of work” you are allowing your brain to remain problem-focused. Your brain only does what it thinks you want it to do. It is not aware that you are open to seeking out a range of possible solutions to your problem when you spend lots of time thinking and talking about the problem of work. So, it thinks it is helping you by keeping the problem of work front and centre. Resulting in you staying exactly where you are. In your brain, focussing on the problem is like telling yourself that you want to lose weight. That you want to get rid of those flabby bingo wings or the belly that has more jelly than it used to. Frankly, that sort of thinking keeps you stuck in the very place that you want to leave! You need your brain in solution-focussed mode instead. What I noticed during my interviews with over 70 successful career changers (so far) is that only when they got really clear on what they wanted instead of their current situation did they get their brains into the right place to be open enough to seek out some alternative solutions. They got their brains solutions-focussed rather than problem-focussed. That seemingly minor shift had a major impact. In short, every single one of these successful mid-life career changers wanted the same thing. Actually, they didn’t just want it – they craved it. Is it time to get really clear on what your very personal ideas about your “More” look like? Here are some direct quotes from career changers that give an indication of what they wanted in their future work. Perhaps some resonate with you? ﻿Take a piece of paper and write down a long list of all things that you’d like more of in your future work and all the things that you would have more of if you did more fulfilling, satisfying work every day. Take a photo of this list, save it as your screen saver or print it out and put it in in your coat pocket, your purse or wallet or laptop case. Talk about it with friends and family over the next few weeks. If you read it a couple of times every day for the next week or so I promise you a tiny little bit of magic will happen in your brain…Dots will begin to connect. I’d love to know if you hit upon any ideas. Join my private community of successful professionals who are interested in designing more joy into their career and tell me what you came up with. I return every email personally and can’t wait to hear how this mini-experiment goes for you. Click the image to receive twice monthly articles, strategies and stories to inspire your career change. Newer PostThe fantasy of start-ups after a global career - is it for you?